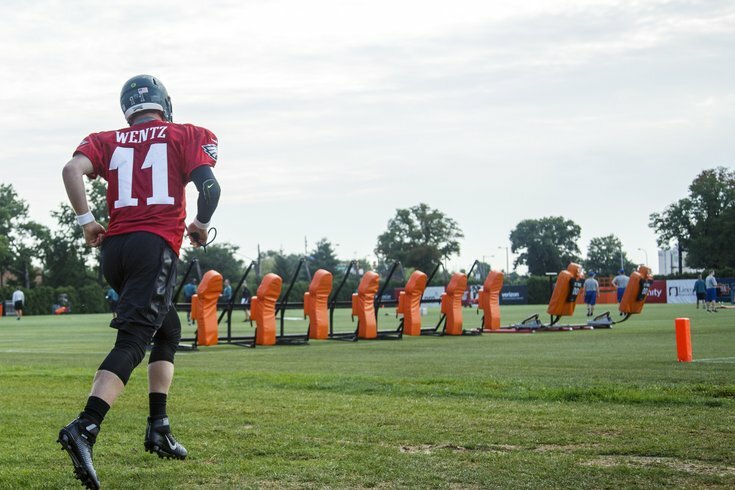 Philadelphia Eagles quarterback Carson Wentz takes the field on the first day of training camp. The Philadelphia Eagles – well, at least the quarterbacks and rookies – opened training camp on Monday morning and it should come as no surprise that the big story of the day revolved around the quarterbacks, specifically where each currently resides on the depth chart. It's been much discussed in the six weeks since we last saw Doug Pederson's team on the field at the NovaCare Complex. And -- surprise! -- not much has changed in the month and a half since OTAs. Because this means that the rookie from North Dakota State would be inactive on gameday, the upcoming season would essentially be like a redshirt year for Wentz, kind of like the one he had as a freshman in Fargo. Not so fast, says Pederson. While Wentz is currently the third-string QB, his place on the depth chart could change (for a variety of reasons). Pederson, who was in a similar situation to Bradford when Donovan McNabb was a rookie in 1999, said that the fans thinking the plan now is the same as it was back then may be disappointed. If Wentz does supplant Bradford, it likely won't happen until much later in the season – Pederson started nine games that season – and as of right now, there's no plan to sprinkle in Wentz throughout the season, like the team did with McNabb. That's likely why Wentz is third on the depth chart. "For me, [playing Wentz sporadically would be] more down the line," Pederson said. "I'm very comfortable with Sam, very comfortable with Chase. It's a little different scenario than what we had in 1999. Donovan [McNabb] really came in as the No. 2. Different scenario this year. "Right now, we're just going to get Carson as many reps as we can, get him caught up, get him to where he needs to be. I'm very comfortable with and excited where Sam left OTAs, where he came in this year, right now. Chase is a solid No. 2. So we're just going to have to wait and see what happens down the road." So how will the reps be broken up during camp? "I'm not officially there yet," Pederson said when asked how he would split the QB reps during camp. "I do know this: Your first two preseason games, typically your starters don't play a ton -- you're trying to save them for that third game and then get them ready for the regular season. So we will focus on the twos and threes probably a little more early in camp, probably give them the bulk of the reps. And then ramp the guys up who we think are going to be the starters opening day, we'll get them more reps towards the end of camp." And while Pederson likes what he's seen from Wentz to this point, he knows there's still plenty of work to be done. Fortunately, for both rookies – the head coach and the quarterback – they still have plenty of time to work out the kinks. Based on what Pederson's seen so far, he doesn't think that will be a problem.